We present to you our new dollhouse decoration game for girls that will bring doll house designing and decorating to another level and enable you to become the best interior decorator in the world! Download this amazing free "room decoration" game now and play ❤ Ice Castle Princess Doll House❤ to create the magical winter cottage for your beautiful princess dolls! Show your great decoration skills and express your creativity with this phenomenal home design game! Design the cutest winter cottage in the snowy mountains and prove that you are number one dollhouse decorator! There are so many fun things to do in the frozen winter weather and putting up winter decorations in your cute dollhouse is one of them! Our incredible decoration game for girls has a variety of decorative items that you can choose from and many other amazing features that will make doll house makeover more fun than ever! ✰ Decorate your own bedroom, living room, kitchen and bathroom! ❤ Over 70 miniature dollhouse decorative furniture elements: modern sofas, tables, bookcases, beds, paintings, flower pots, lamps and so on! ✿ Winter home decoration items: Christmas tree, mistletoe, snowman and much more! ❤ Collect all beautiful dolls and pets and create a family! Design the dollhouse winter wonderland that fits your style! We know all girls love doing home decoration and we made it possible for you to design and decorate the most beautiful winter doll house and have the best time playing this house decoration game! Start right now because there is so much to do – you need to make the perfect winter house design, pick the right decorative furniture, carpets and wallpapers for every room! 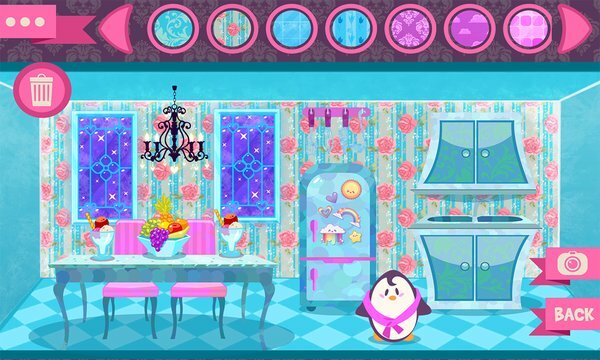 This "doll house decorating game" for girls is so addictive that you won't be able to stop decorating rooms once you start! We guarantee you will enjoy building your "frozen dollhouse" immensely! Every girl loves home makeover games and that's why our doll house game is the best choice for you! And, if you need ideas how to decorate your room for Christmas, our winter dollhouse is full of amazing winter decoration items that will inspire you! ❤ Ice Castle Princess Doll House❤ enables you to decorate your dollhouse in so many different ways with this fun decorating game! First, you need to pick one of four rooms that you want to decorate- kitchen, bedroom, living room or bathroom! Then, you can choose between a variety of miniature decorative furniture pieces and decide which ones you want to use as room decor for each room! Find the right chairs, table, refrigerator and oven for your kitchen! Don't forget bookshelves, lamps, wardrobes, and beds for the bedroom and many more home decor pieces! But wait – it's winter time and the snow is falling all around, so you must find perfect winter decorations for your dollhouse such as a christmas tree and candles to complete your house decoration! If decorating a house for your doll is what you love to do, you must download our new free dollhouse game for girls ❤ Ice Castle Princess Doll House❤ to your mobile phone or tablet right now and begin your doll house decorating winter adventure!